A lyrical yet assertive work, “House of Hummingbird” is the soulful debut feature of Korean director Kim Bo-ra, a Columbia University School of the Arts Alumna, following a series of shorts, often focused on family life. Her subtle indie film had its world premiere with a “bang” at the 23rd Busan International Film Festival, where it has been met with praise and won the KNN Audience Award as well as the NETPAC (Network for the Promotion of Asian Cinema) Award. “House of Hummingbird” received the Pitch & Catch Megabox Grand Award from Seoul International Women’s Film Festival and received production support from Korean Film Council, Seoul Film Commission and Seongnam Cultural Foundation. Moreover, it was selected for IFP Narrative Lab and received post production support from Sundance Film Festival. Eun-hee (Ji-hu Park) is a 14-year-old girl entering the problematic age of adolescence in 1994’s Seoul. The date is told at the beginning of the movie but it is also reiterated during, via three very precise events – two of them very relevant in Korea’s recent history. The movie cleverly opens with one of the most symbolic episodes of the whole film, that well introduces the protagonist Eun-hee. The girl bangs at the door of her apartment and increasingly gets distressed because the mum is not opening. She calls out, angry and scared at the same time, when she finally realises she is banging at the wrong door, one floor below. When the camera slowly zooms out we get to see the council estate were Eun-hee’s family lives, rows and rows of floors, doors and windows all looking exactly the same. Eun-hee is lost in life, she doesn’t know where she belongs and is craving for love and attention. The youngest of three siblings, Eun-hee moves in a universe constellated by negative masculine figures – pushy teachers, a stressed father, an overachieving and violent brother – and governed by the toxic idea that everything in life will be determined by her school results. Her family is somehow dysfunctional; the parents run a rice cake shop and work long hours to make enough money for the family, but with the unwanted side-effect of being often absent and emotionally distant, her sister is in full rebel-teenage mode and her big brother is plagued by a school performance anxiety that often results in bouts of violence towards poor Eun-hee. While the year 1994 unfolds with the World Cup, the death of North Korean leader Kim II-sung and the collapse of the Seongsu Bridge, even Eun-hee’s little world is shaken by new, unsettling feelings; she has an innocent love story with a boy and at the same time explores her feelings for a girlfriend, she observes a family grievance when her uncle dies and experiences a health scare when a lump is found on her neck. Lonely and insecure Eun-hee restlessly looks for love and sweetness (like the bird of the title) until, by chance, she comes across an adult who is different from all the adults that surround her. Young-ji (Kim Sae-byuk) her cram school teacher, is a young woman with melancholic eyes that suggest a bumpy path to happiness and, above all, with ears to listen to Eun-hee. “House of Hummingbird” belongs to the happy family of films like “The World of Us”, “Han Gong-ju”, “A Girl at My Door”. 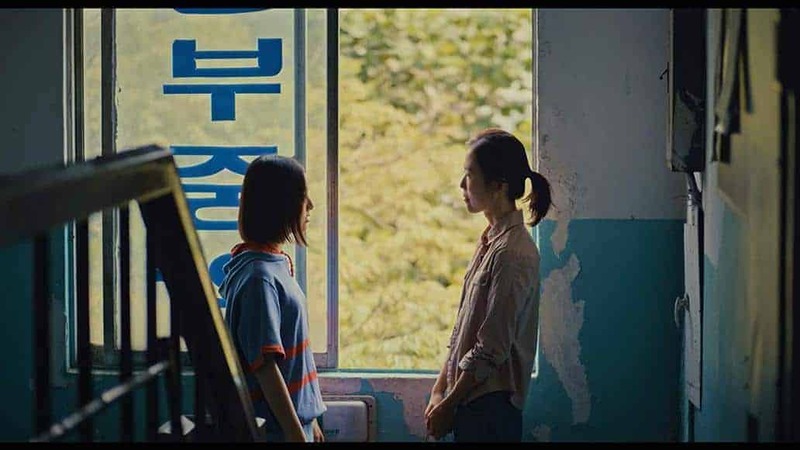 It’s a subtle observation of a teenage girl in Korea in the typical detached “slice-of-life” manner but it’s also a portrait of the multifaceted environment and the social circumstances that have impacted and marginalised the girl and her family. Layered and rich of humanity, the characters of “House of Hummingbird” are far from black and white and the reasons behind their actions are complex and nuanced. The movie is almost entirely on the shoulders of young actress Ji-hu Park who does an incredible job portraying all the shades of loneliness, curiosity, anxiety that rattle Eun-hee’s heart. Watching her enjoying the sweet taste of unexpected attentions and care in hospital or opening up to her special friend teacher is a real joy. Her variety of facial expressions are often captured and magnified in long shots and close-ups by cinematographer Kang Gook-hyum, (“The Shameless”) who has bathed the whole film in a soft light that tastes of remembrance, longing and hope. Kim Sae-byuk is also perfect in her short role as a gentle comet in Eun-hee’s universe. Kim Bo-ra has created Eun-hee, a 90’s Korean girl, to channel the angst that all adolescents experience; the fear of facing an Ocean on a tiny raft. In a poignant scene near the end, the three siblings at dusk watch the collapsed Seongsu Bridge, showing their emotions unashamedly. They are three little sprouts, overwhelmed by the tragedies that life can throw at you, and yet destined to process it and move on.